I love Professor Layton. It’s my second-favorite series, only to The Legend of Zelda. 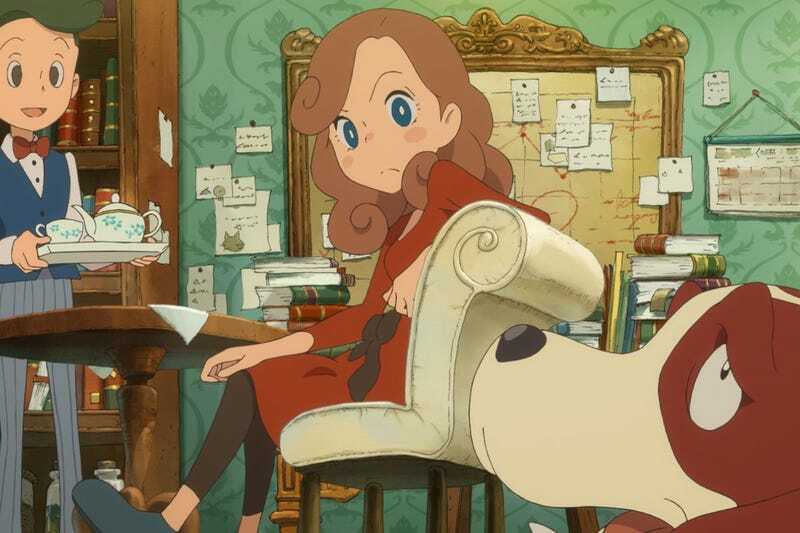 Layton’s Mystery Journey: Katrielle and the Millionaire’s Conspiracy released on July 20th on iOS and Android all around the world, but while Japan already has the the same game on 3DS, those of us outside that country will have to wait for October to play the game on our own 3DS systems. I will be among the many who have decided to wait these three long months to play on my system of choice. I’m not naive enough to think that smart devices don’t have good games on them. I’ve played games that I’ve enjoyed to an extent on smart devices, such as Pokemon GO (back when it was a novelty), Fire Emblem Heroes, and Attack the Light, but I’ve never been able to stick with them, and it’s no fault of the game’s. (Well, maybe it’s Pokemon GO’s fault for being a total mess.) It’s the fault of the platform they’re being played on. One argument to be made is that I like to play games with buttons. Pressing a digital button on a screen just doesn’t carry the same weight as pressing your thumb down to hear and feel that soft, satisfying clack when you press a real, honest-to-goodness button. It’s much less ambiguous than pressing somewhere on a screen and having the same response. There’s only two problems: the best mobile games use touch controls instead of a virtual controller, and the Professor Layton series can be played without pressing a single button by using the touch-screen. Maybe it’s because I use my phone in bursts, like most other people. If I have a second to pass the time while in line or waiting for something, I’ll bust out my phone and check the internet or my emails, etc. Sure, I’ll jump in and out of 3DS (fun little side-note: I accidentally typed Fire Emblem when I meant to type 3DS because they’ve been so synonymous for the past few months for me.) games in the same circumstances, but at least they’re separate. I have my machine for games, and I have my machine for stuff that is not games. Or perhaps the real reason is that I always seem to lose my progress. I’d been playing a lot of Attack the Light, and had really been enjoying what I’d played of it, but as the game progressed, the levels got longer. And even though in theory the game would pause and then resume once you went back to the app, it always seemed to restart even if I just put my phone in sleep mode for a few minutes. After playing the same level probably around 15 times, I gave up on it, and haven’t returned since. Maybe it’s because of the screen. Sure, it’s high quality, but it’s not 3D, a feature I actually have used in every single 3DS game since the New 3DS’ eye-tracking 3D. There’s also only one screen, so everything ends up looking smaller on the phone than it does on the 3DS. Perhaps this problem would be solved if I had a tablet, but currently the only two tablets I own (if you can call them tablets) are the Wii U Gamepad and the Nintendo Switch, neither of which are capable of playing the new Layton game. This, possibly more than anything else, built up mistrust between me and the platform for games, and I haven’t really recovered from it. There might not be one definitive reason for why I don’t enjoy playing on smart devices, but there are enough small grievances to just make the overall experience unfavorable. Maybe there will come a day when I find a device, maybe an iPad or an Apple TV, that can play mobile games well enough. But to this day, there hasn’t yet been a compelling-enough reason to buy one.